Few today will have heard the name of Earl Doherty. But in the late 90s and early 2000s, if you were one of those posting online in the religion groups in Usenet news, you would inevitably encounter some atheist gleefully parotting his theories. 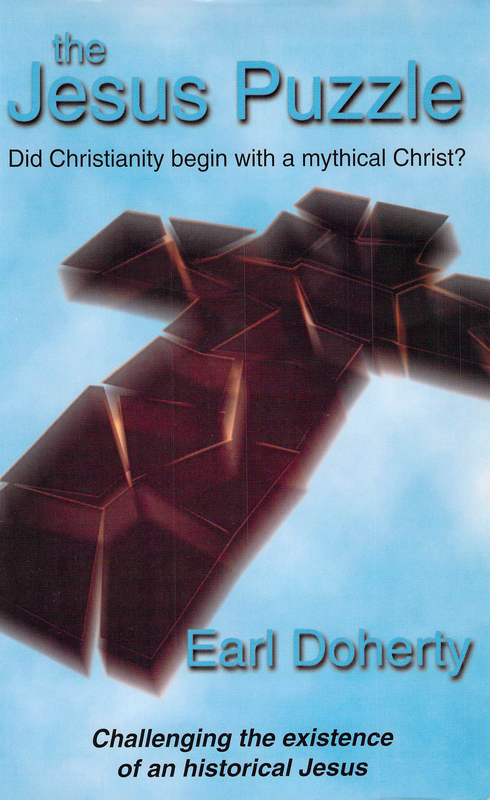 Doherty was a Canadian atheist, who used the nascent internet to push the claim that Jesus never existed. Doubtless he found this in long-forgotten intellectually disreputable atheist literature. But the popularity of the claim among online teenage atheists is entirely his work. Others would come later, but he was the first. Doherty has faded from the internet in the last decade. His Wikipedia page gives his date of birth as 1941, which would make him very elderly now. So my own memories of his activity are therefore historical data now. He started with a website, jesuspuzzle.org. This contained his theory, in the form of a series of pages or essays, all of them written with the utmost certainty. The original versions could be pretty crude. The Christian apologist J.P.Holding attacked them fiercely. His essay on Minucius Felix, reflecting very outdated views on his priority to Tertullian, came to my notice through postings on usenet. I felt obliged to add a page to my site debunking them. Doherty’s response to these attacks was always the same. He would use the material supplied by his critics to improve his material. He never changed his mind, or withdrew his claim, but instead he would edit or reword parts of the essay to blunt the criticism or make the objection irrelevant. In the meantime he would trade angry responses with critics in the online forums, often resorting to ad hominem arguments or insults. I remember watching this process in progress. It came to me then that, rather than achieving anything, J.P. Holding was effectively acting as an editor, helping Doherty make his book more convincing. I had no desire to do the same, so I did not engage much with Doherty. At the end of this, he worked up his material into a book, The Jesus Puzzle: Challenging the existence of an historical Jesus. This has a copyright of 1999, and doubtless appeared at that time. The book was very well received by those at whom it was aimed. The prose was immensely convincing. I remember reading it, and I had to step back in one passage, put the claim made into my own words – rhetoric is a means of persuasion, I was reminded – and sanity-check it. The song of the words lulled and convinced many. Doherty continued to work. But somehow he became less important. Newer peddlars of the same idea such as Acharya S gained notoriety, and publicised themselves. The claim itself was nonsense, but it enjoyed quite a vogue. Doherty published a revised version of his book in the mid-2000s, but nobody noticed. Other publications likewise failed to attract attention. He was, by this time, yesterday’s man. His task was done. I believe he last published in 2009. I have not seen him online since before that. He did some real harm. Online atheists were always noxious, but few believed that Jesus never existed until he came along. He helped to add nonsense and misinformation to the internet. His influence on history online, insofar as lay with him, was entirely baleful. The book’s influence on the lives of others was also pernicious. Even atheists such as Richard Carrier, who held an ancient history degree, might have remained sane longer were this theory not around to lead them into nonsense. I would imagine that a few teenagers were induced to abandon a good upbringing and indulge in the horrid vices of our period under the influence of his claims. On the positive side, the whole school of “Jesus myth” that he founded doubtless stirred many of us to look at the data, and think out clearly how we know what we know about antiquity. The school seems to be fading in influence now; searches on Twitter for atheism show a raggle-taggle lot. No doubt some other craze will arise. Yesterday I found a copy of his book on my shelves. I bought it for reference on the 16th May 2002, from a bookseller in this country. Atheists like Doherty or Acharya S often cynically responded to critics with “you haven’t read my book”. In those days there no PDFs around, so I thought that it would be useful to have on-hand. But, unknown to me, it was already fading in influence. I don’t think that I ever used it. So for 16 years it has occupied space in my house. No longer: I converted it to a PDF last night. Sic transit gloria mundi. So too passes every nonsense of fashion, to become dust, merely material for the musings of antiquarians. Let us also remember this man in his old age, forgotten as he now is. His life work was nothing or worse. In the end he was only a tool for the enemy of all mankind. May he find God, and find mercy. Amen.